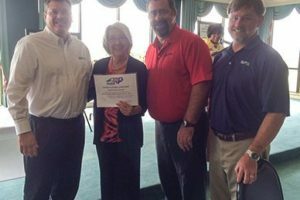 SPX Waukesha’s Goldsboro facility was presented with a Silver Safety Award for the second consecutive year on May 6, 2015, by North Carolina’s labor commissioner, Ms. Cherie Berry. The award ceremony was held at Lane Tree Golf Course in Goldsboro. In attendance for SPX were Troy Kabrich, vice president and general manager; Rodolph King, operations manager; and Craig Fulcher, safety and environmental manager. North Carolina Department of Labor Safety Awards Program, in continuous operation since 1946, recognizes private firms and public agencies throughout the state that achieve and maintain outstanding safety records. The program is designed to stimulate interest in accident prevention and to promote safety in the workplace by providing an incentive to employers and employees to maintain a safe and healthful workplace. The Silver Award criteria includes lost workday cases but not restricted work activity, and companies must attain a rate for cases with days away from work that is at least 50% below the industry rate. Employee involvement and management commitment are key factors in making SPX Transformer Solutions a safe place to work. The Safety Committee and Risk Assessment teams identify and work to resolve safety issues before an injury occurs, while a medical emergency response team helps raise awareness for health and safety issues throughout the facility. Additionally, supervisors are trained on understanding OSHA rules and regulations as well as essential safety principles, practices and management techniques to help them understand the importance of the programs in which their direct reports participate. The entire organization sustains its excellent safety results by working together toward common goals. Congratulations to everyone in Goldsboro for earning this safety recognition! Keep up the excellent work!